He was impressed by the dog’s intelligence and disciplin, he chose to purchase the dog and changed its name from Hektor Linksrhein to Horand von Grafrath. Max von Stephanitz started the German Shepherd Dog Club and created the guidelines for the breed’s standard. The motto for the new breed was “utility and intelligence“; good looks was not a priority. In the years to follow Germany became more industrialized, and von Stephanitz was quick to realize that the needs for the German Shepherd might decline. To ensure that the breed would continue to be relevant, he worked with police and other service workers to ensure a place for the dogs in the working force. Since the breed was bred to be highly intelligent and athletic, they were the perfect fit. Max von Stephanitz is the reason the German Shepherd is used world-wide as a world-class working dog. #2 – Why Is It Called A German Shepherd DOG? 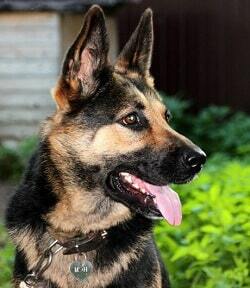 The German Shepherd Dog is one of the few breeds whose official name actually includes the word “dog”. This is a bit weird – or is it? The word “dog” was added so people understood whether you were talking about a human German Shepherd (someone who tends the livestock), OR the dog helping him. German Shepherd’s bite has 238 pounds of force — a human’s bite has just 86! Yet another reason the breed was excellent to work as a police-dog. No one runs away from a German Shepherd twice. This slow motion video shows you how a German Shepherd drinks – you must have wandered how they get any water in their mouth. You probably already knew that. But even though German Shepherd are quite thin the first two years of their life, they quickly grow a huge muscle mass. They’re large and powerful dogs, ranging from 22 to 26 inches and usually between 50 to 90 pounds, with females on the lower end of the spectrum. If they’re not properly trained, they can easily throw down an adult male to the ground. The German Shepherd Dog is the 2nd most registered dog in the United States. The reason is probably found in the breed’s diversity – they are popular as a family, guard, performance, show, military, police and service dogs. It can pretty much do everything. German Shepherds LOVE their owners, but they aren’t keen on strangers. However, a properly trained and socialized German Shepherd aren’t aggressive with strangers. But they will let it be known that they don’t want strangers lurking around its families territory. In addition to being a bit standoffish with strangers, German Shepherd belt out a vicious-sounding bark when anyone knocks on your door (unless their owner shows them that it is expected). GSD’s won’t hesitate to protect its packs members. They’re especially – and sometimes to a fault – protective of children. There are lots of tales of heroic German Shepherds in the breed’s short history. And one of them is of Filax of Lewanno. He was honored at Westminster in 1917 for bringing 54 wounded soldiers to safety in WW1. Dorothy Harrison founds “The Seeying Eye” in 1929, which started training German Shepherds to use as guide dogs for the blank. Morris Frank, a blind man, read about what Mrs. Harrison was doing and wrote to her that he wanted one of those dogs – and that he wanted to help spread the word about these types of dogs in the US. Read the entire story at wikipedia. The breed Doxie, was ridiculed for being German after World War 1. However, WWI helped increase the German Shepherd’s popularity in the United States. American Soldiers saw what the GSD was capable of – while fighting the Germans. And many of them chose to take one with back home. Luckily it is rare, but some German Shepherds can have pituitary dwarfism, and as a result, the German Shepherd will look like a puppy forever. Even though this sounds kind of amazing – the condition is often accompanied with a whole slew of health problems. You probably know who Rin-Tin-Tin is. Rin Tin Tin was a German Shepherd rescued from the World War one battlefield. His savior, an American soldier named Duncan Lee, trained the GSD to work in silent films. Rin Tin Tin was a huge star, and extremely popular, that Warner Bros, would create a Rin Tin Tin movie whenever it needed money. Finally, he was awarded the American Humane Association’s first Legacy Award in 2011. He also has a star on the Hollywood Walk of Fame. Before Rin Tin Tin, there was Strongheart. A male German Shepherd who became one of the earliest canine film stars. Trained in Germany as a police dog and serving in the German Red Cross, he was brought to the US at the age of 3 by filmmakers Launce Trimble and Jane Murfin. Strongheart starred in lots of movies, as well as a 1925 adaption of White Fang. 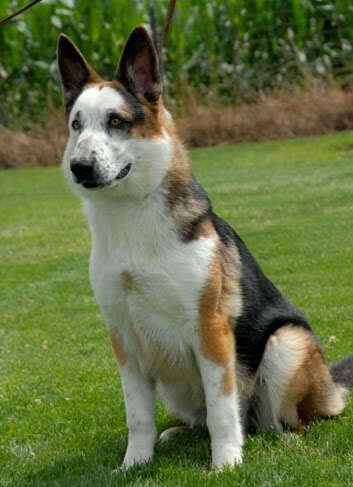 A number of these were very succesful, and did lots to increase the popularity of the German Shepherd breed. He was a beloved celebrity in his day, and there is no doubt that Strongheart paved the way for the much better remembered Rin Tin Tin. Fun fact, Strongheart and his mate, Lady Julie, had lots of puppies and their line still exists to this day. In 1914, the German Shepherd breed had become so popular in the US that there was talk of changing the name to “shepherd dog” or “sheepdog” – dropping the German. In fact, this did happen in 1917 where the AKC removed the word “German” in front of the breed’s name. However it was changed back in 1930 by the members of the Breed’s club. You might think you know all the colors of the GSD. You’re probably familiar with the original black & tan, black, or white, BUT the AKC actually recognized eleven colors – the ones just mentioned as well as: bi-color, black & cream, black & silver, black & red, blue, gray, silver and savle. And to top it all of, there is actually something called “Panda Shepherds”. They look incredible. #20 – PLAY ONCE FEATURED SIX GERMAN SHEPHERDS AS ACTORS. In the mid-’80s, a Dutch director by the name of Whim Schipper created a play that starred 6 German Shepherds. The GSDs got drama lessons in Amsterdam and were motivated to act with treats. Called Going to the Dogs, the play featured a traditional family plot: The daughter brings home a new boyfriend, and love, jealousy, and parental worries come into play. Unsurprisingly, the play was a huge flop – even the theater’s manager left early. German Shepherds are one of the smartest dog breeds on the planet, you probably already knew that. But did you know that they ranked 3rd when more than 200 AKC judges rated over 100 breeds on their intelligence. German Shepherd can have many types of medical conditions, but the most common is hip dysplasia. However the debilitating condition is usually the result of poor breeding practices. Always ask to see a “Ortopedic Foundation for Animals” if you get a puppy from a breeder. Being wildply popular in the United States, you would think the German Shepherd Dog, as a breed would have lots of “Best in Show”-tiles. It actually doesn’t. The German Shepherd has only won once, in 1987. The dog was Ch. Covy Tucker Hill’s Manhatten, owned by Shirlee Braunstein and Jane Firestone. A video made by Animalist is great for giving a short introduction to the greatest breed on earth. That’s all folks. Which one amazed you the most? Or do you know something I don’t that should be on this list. Let me know in the comment section. I have a German Shepherd sambuka, he is now 6 years old and he is the most amazing intelligent animal I have ever had and can’t imagine my life without him. They definitely are a breed that need lots of socialization and rules from a young age to ensure a well behaved animal. I loved your article and it gives much insight to the breed. Today i just visit this great site ! a lot of very informative and helpful information i found on the website. Thanks the admin for providing visitors such a great information ! keep this good work up ! Very good article, I love German Shepherd. Time for an update. Rumor the German Shepherd Dog won the 2017 Westminster Best in Show.